If you’ve ever had to call a plumber for an emergency, you know that’s an experience you would like to avoid. Did you know there are simple things you can do to prevent plumbing problems? Try these maintenance tips and tricks and you can lower the chances that you will need plumbing service in Roanoke. Look for signs of trouble. Be aware of the signs of plumbing problems: leaky faucets, water under cabinets, water spots in ceilings or walls, or rocking toilets. Don’t wait to have minor problems repaired. If you do see any of these signs, address them immediately. Call for plumbing service in Roanoke before the problem worsens. Know your home. Locate the shut off valve for your home’s water supply as well as the sewer valve. Figure out how to turn off the water to sinks, toilets, and major appliances that use water such refrigerators and washing machines. Major water leaks can be stopped before they cause serious damage as long as you know what to do. Prepare for cold weather. Frozen pipes can be a big problem. But they can be prevented and easily handled without causing busted pipes. Insulate exposed pipes in garages, basements, or crawl spaces, as well as pipes that are located in outer walls. If temperatures are supposed to be below freezing overnight, open cabinets to allow heat to reach pipes and let a faucet drip. If a pipe does freeze, turn off the water to your home, open a faucet, and use a hair dryer to thaw the pipe starting at the end closest to the tap. After the pipe thaws check carefully for any cracks or leaks. When these maintenance tips are not enough, Varney has your back. 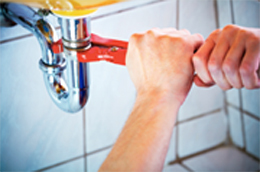 A reliable plumbing service in Roanoke, Varney can handle any plumbing problem you may have. Call (800)456-1399 or (540)343-0155 for prompt service.